William John Cliftop Haley Jr. was born in Highland Park, Michigan on July 6, 1925. His family was interested in country music and he learned to play guitar at an early age. When he was 15 he left home to tour with a country and western band and by 1951, when he signed a contract with Essex Records, he was leading a band of his own. The band was called The Saddlemen and their first record was a version of the rhythm and blues hit "Rocket 88" and prefigured Haley's later style, an amaigam of country, the blues and pop influences. >In 1952, Haley renamed his band in order to place his name outfront and came up with the clever name Bill Haley and The Comets. A year later the band recorded their first hit, "Crazy Man Crazy." In 1955, bandleader Bill Haley and His Comets recorded a landmark rock and roll song, "(We're Gonna) Rock Around the Clock," which held down the number one spot for eight weeks and went on to sell 41 million copies worldwide. In Britain, "Rock Around the Clock" has re-entered the charts seven times, most recently in 1974. If only for the impact of "Rock Around the Clock," in which Haley adapted a black R&B song to a more streamlined rock and roll beat, Haley would deserve a place in the Rock and Roll Hall of Fame. Yet his impact in the early days of rock and roll went well beyond that. Two years earlier he'd put out "Crazy, Man, Crazy," an original song that became the first rock and roll record to make Billboard's pop chart. For most of the Fifties, Haley was a presence on the record charts with and in teen-oriented movies. At their first session for Decca, they cut "Rock Around the Clock" (which had originally been recorded in 1952 by Sunny Dae. Little attention was paid to Haley's version upon its initial release in the spring of 1954. 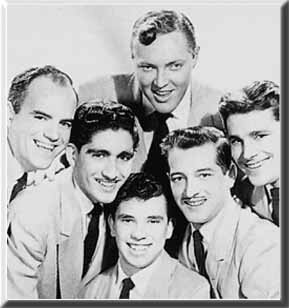 The group followed it with their cover version of Big Joe Turner's "Shake, Rattle and Roll," which cracked the Top Ten in July 1954 and sold a million copies. "Rock Around the Clock" got its second lease on life by being chosen for the soundtrack to The Blackboard Jungle, a 1955 movie about high-school delinquency that generated controversy in the press and pandemonium among the young. In effect, "Rock Around the Clock" became an anthem for rebellious Fifties youth. A 1956 movie named after the song, which featured nine lip-synched performances by Haley, made him a star here and abroad. His celebrity was particularly long-lived in Britain, where he continued to be treated as rock royalty into the Seventies.